More than 600 customers have put down deposits of up to $250,000 each to experience several minutes of weightlessness while watching the sky fade from light blue to the blackness of space. MOJAVE, Calif. — Virgin Galactic’s VSS Unity SpaceShipTwo space plane reached suborbital space again during its fifth powered test flight Friday morning, landing back on the runway at the Mojave Air and Space Port about an hour after launch. Steps away from the flight line, in a 48,000-square-foot hangar, the spaceship’s next two successors — intended to carry paying customers to space one day — are taking shape. 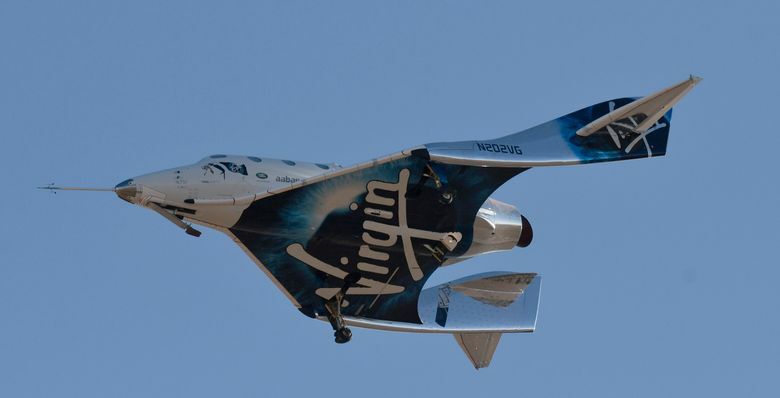 Company officials emphasize that Virgin Galactic is still very much in the test-flight phase. The company reached suborbital space for the first time in a December flight but wanted to make sure it could repeat that achievement. The space plane’s test began shortly after 8 a.m. PST Friday. The craft was carried by the larger, twin-fuselage plane known as WhiteKnightTwo to an altitude of about 45,000 feet, and then released under its own power around 8:53 a.m.
SpaceShipTwo was flown by pilots Dave MacKay and Michael Masucci. For the first time, the space plane had a third crew member aboard — chief astronaut instructor Beth Moses. To provide that, Virgin Galactic will need to make more spaceships. The shop floor at one of Spaceship Co.’s Mojave hangars was buzzing on a recent weekday, with a number of people working on aspects of the next two SpaceShipTwo space planes. The company has just over 500 employees. Composite materials are the company’s core competency, Palermo said. Both SpaceShipTwo and the larger carrier aircraft were built with carbon fiber. Composite materials have strength and light weight, a combination derived from sandwiching honeycomb-like materials between sheets of carbon fiber. Technicians at the Spaceship Co. facility wore gloves while working with the materials because human fingers have oils that can “contaminate the product,” Palermo said. The company aims to finish the next spaceship this year.